It starts out as a simple need. Maybe you want to listen to music during the workout, or need a high quality noise canceling headphones for your urban commute. So you start searching for a nice pair of headphones. And before you know it, the process gets so complicated. For someone, music is life, for someone may be an audiophile. For those conscious listeners, best wireless headphones play a pivotal role in leading life. Even now for all walks of life from sportsman to gardener, listening music enhances the ability to work. 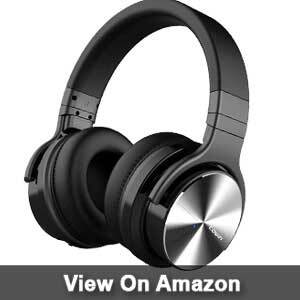 Different kinds of headphones are available in the market right now and to really get the best deal, you have to stay aware of the available products in the market. More than that, you need to know, what they offer, and how they deliver. For the price, these headphones are definitely worth it regarding sound quality. The TaoTronics wireless headphones provide a pretty good range. It comes with an aux cable so you can use that too. The impressive quality build makes it stunning to look. Now, the noise canceling feature doesn’t completely drown out the external noise but keeps it to a muted ambient level. It blocks the sound out to the low-level background noise. Though it can’t prevent people from talking around you, it certainly can stop the noise to disturb you while you’re in communication. On a single charge, this headphone will go on as long as 25 hours. However, what stuns me? I think the big battery inside the headphone. Though it has no AAA battery, but it can serve you up to 25 hours. On the other hand, if the charge is running out, you can use the headphone by plugging in. Another great feature is that the headphones are great for doing long calls anywhere. It is made especially for the long time talking. It allows you to receive the call while you are listening to music. You need to press the calling button right on the ear cup. The noise canceling technology helps you smooth communication over the phone if you’re in the crowd. The set comes with a noise-canceling microphone. And if all of these features got you excited, let me add that these headphones are also quite comfortable on the ears. Ear cups are tiny to handle for a big man. Not up to the mark for louder sound. Really comfortable and really colorful, Mpow 059 comes in 7 different colors. The cups and padded with memory protein. The cushiony earmuffs are very comfortable on the ears. The sound quality in these headphones is impressive. The bass entirely gives it an edge, so does the clarity. Mpow is designed for excellent sound quality with CSR chipset. The robust and sturdy ear cushion design provides high fidelity sound to the music freaks. However, it can be easily compatible with all the latest devices, i.e., smartphones, tablets and other Bluetooth devices. The driver inside the headphone ensures crystal clear sound through connecting to the adaptor. However, you need an updated driver for your PC or laptop. On the contrary, you may need a distinctive Bluetooth adaptor to connect your TV. The built-in microphone of the headphone provides a high quality hands-free call when you’re unable to reach the phone. It can connect from 33 feet precisely. The latest version of Bluetooth ensures a stable and quick connection between the headphone and the devices. The Mpow 059 will last up to 13 hours in a single charge. Even if the battery runs out, it comes a cable so you can connect it directly. The headphones don’t have active noise, but it totally compensates for that with sound quality. The headphone is foldable so when on the run, just stash it anywhere. The headphones come packed with a protective pouch if you want to take better care of them. Sony definitely outperforms other headphones concerning noise canceling with this model. The noise canceling feature is simply incredible when activated. The headphone syncs effortlessly with the phone. The mobile app for this headphone offers a variety of features and graphs so you can toggle those settings to get the perfect audio experience for yourself. The headphones run for 30 hours from a single charge which is amazing as it recharges super-fast. For 10 minutes of recharging, it’ll run for 70 minutes. 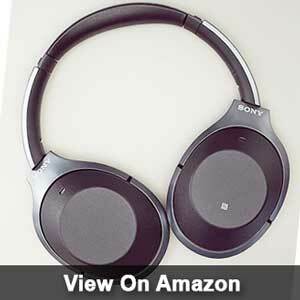 The buyers will not have to worry about these Sony headphones being durable or comfortable. They ensured both with this model. First of all, I want to mention here the excellent feature of the touchpad. Though it is not a new invention, but Sony enhances the feature to control the volume by swiping. It is intuitive and easy to operate for the new users. Do not hesitate to control your long cherished well-equipped headphone. Moreover, you can easily connect to the Siri, the google assistant feature by long pressing on the touchpad. However, to stop the music and receive a call, you have to tap double. Also, if you need to listen to others, you have to disable the noise canceling by tapping the cup which is near the ear. And finally, I am impressed with the app which is available both for android and apple products. You can see everything of your headphone from the app. Even the screen shows you the battery level for 100%, 70%, and 50%. It helps you to charge the headphone at the right time. 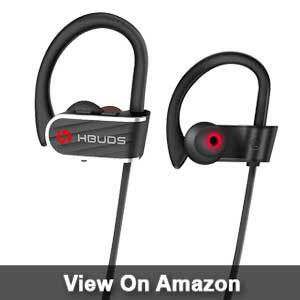 Get all pumped up in your next gym session with these HBUDS sports earbuds! Put these on and get your workout on without worrying about sweating on them. This headphone is designed for the sporty ones of you, so it offers IPX7 water protection. How much is that you ask? It comes with water-resistant Nano-coating technology which you can rarely find among other headphones. It means they can stay under 3 feet of water for around 30 minutes. So, it can be an excellent companion of jogging, yoga, fitness, gym or any other indoor or outdoor activities. The sound quality is excellent, with an extra boom on the bass which is more practical for its use. Also, the deep bass produces flat and sharp sound to the music sensitive people. The composition of the driver, CSR chip, and Bluetooth get you superb sound. From a single charge, it’ll run for up to 9 hours, and no one should be working out that long right? It takes an hour and a half to recharge. Furthermore, the standby time is up to 250 hours, and apparently, it’s out of imagination. You can see the notification status of battery level as well as the indication status of the headset. The headphones will work up to an excellent range of 30 feet. The earbuds may be small, but they come with full set of essential features of audio control on the right bud. So skip and change track or receive a call mid-workout with the push of a button. Different sizes of ear tips to fit all walks of life. Another great sports gear is the Phaiser BHS-760. 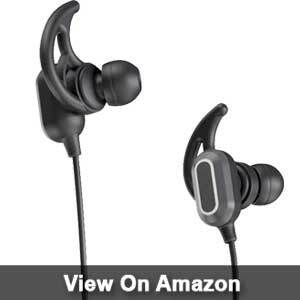 These earbuds come with detachable wingtips, making your jogging or any physical activity easier with its secure fit. They are also sweat-proof, so no need to take your workout down a notch worrying about them. As for sound quality, it’s definitely as good as the high-end ones, but the quality difference isn’t staggering either. The combination of 8mm speakers along with 4.1 version Bluetooth ensures accurate and superb sound quality. Moreover, the bullet-shaped memory foam tips prevent your sound from extreme noise. The earbuds do a pretty neat job of isolating external noise. The Bluetooth earbuds are connected with each with a cable. You can adjust the size of that with clips that come in the package. That way, it doesn’t oddly hang around your neck when you put them on. Did I mention the earbuds have magnets? The headphone can be wrapped around the neck and magnets holding on will let you stroll around without worrying about losing them. With all of that goodness, this headphone also has a noise-canceling microphone. Even so, the patented winged headphones are available with different sizes for different people. Compared to the other headphones, you can find over-ear and under-ear which fit comfortably. You can’t see it from anything else. So finally, which amazed me? I think it’s the lifetime sweatproof warranty. Though you don’t depend on a single headphone for rest of your life, but the lifetime warranty somehow satisfies us with quality. After all, if you face any problem with your earbuds, don’t forget to get a replacement with the no-questions-asked policy. These are about as discreet as it gets. Rowkin takes their Bluetooth headphones to the next level with these True Wireless Earbuds as they come in as two separate earbuds, not even connected to each other (so try not to lose them). Despite what you may think, the earbuds are not going to pop out of your ears once you pick the right gel size for you. The earbuds look sleek and come in an even more cooling looking package that can be mistaken as a lipstick. This is also the charging unit. 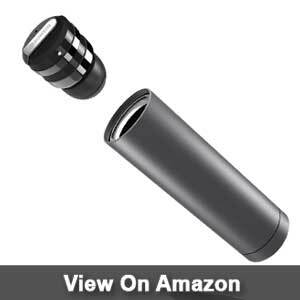 The earbuds go on each side of the charging tube and are held there with a magnet. However, that’ll buy you a couple of hours of usage time. The charger can fully charge the buds twice. So you can always carry some battery life in your bag. It provides you a 3-hour play time for wireless playing. On the contrary, if you talk over the headphone, it may lead you to 4-5 hours. How do they sound? The earbuds look tiny but are pretty robust, made of stainless steel for better sound quality. But, the audio quality definitely isn’t the wow factor. The bass doesn’t come very strong, and some high and low notes may not sound so crisp. So while they do perform really well and has its perks, these may not be the best Bluetooth headphones as per sound quality. They are great for a hectic session of work with light music, long conversations, even to get sweaty! These tiny earbuds come with IPX5 water protection. The buds can be connected to two Bluetooth sources simultaneously. So shuffle two devices while playing audio files without a hassle. You can use these to activate voice commands as well. 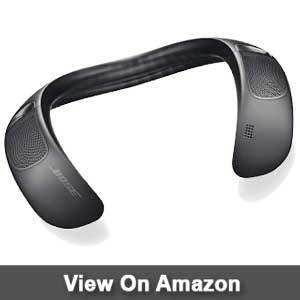 Another excellent headphone for the fitness junkies would be Bose SoundSport Wireless Headphones. The signature Bose sound quality is combined with a sturdy and weather resistant frame to bring out the best of your workout experience. The headphones are certified IPX4. For those who need me to break it down, don’t worry about sweating, but don’t take it for a swim either. It’ll handle splashes and survive easily. Moreover, the StayHear+ tips are designed for comfortable and stable listening to music. The earbuds are a little bigger than usual, the cables are reliable and flexible, and comes with an in-line controller. 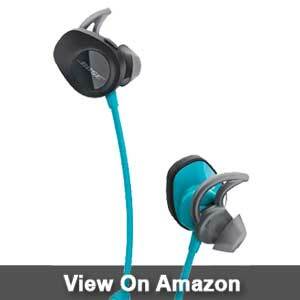 Made with silicone materials, Bose Soundport aqua is exceptionally durable and sturdy to last long. At this point, you’re wondering about the sound. Bose SoundSport comes with a dynamic equalizer. This headphone is suitable for easy listening, the sound is smooth and crisp, even at high volumes. The bass is adequate, not necessarily pounding. You can download the app for Bose headphones and customize options other than sound. The Bluetooth range is good. You can put these on and walk around the house without facing disruptions in the connection. Headphones will perform 6 hours between charges. It can’t be connected with a cable, so when the battery runs out, there’s nothing to do but charging it. So if you need a comfy pair of sturdy headphones with clear sound, you’ll find these great. To help you in the remote area from your home, Bose provides you a carrying case along with the portable charger. So, you’re never away from your favorite music. If headphones are too mainstream for you, try wearing a speaker instead! Jokes aside, this is a lifesaver (literally) for those who want to enjoy music without getting disconnected from the rest of the world. It sits around your neck and connects wirelessly to your device. So cyclists can take a phone call or enjoy music while on the go, without getting run over. Bose leads the audio industry for its innovation and contribution to the audio industry. The latest patented waveguide technology along with digital signal processing provides accurate and impressive sound. It will change your sound experience by bringing a revolution with thick and rich sound from surround speakers. Now it’s understandable if you don’t want to walk into a place bursting music. But these speakers are great, and a person will walk by you without a hint of what you’re listening. Don’t think this compromises the sound quality. Alternatively, even better the three button you’ll find the wearable speaker. It integrates Google assistant/ Siri for voice command. So, now you can access your phone for receiving a call, play or pause music tracks or even making a call. The speakers give you a deep surround audio experience. The speakers resist dust, static, and has IPX4 water resistance. With 12-hour battery life, this speaker can be your best friend for a long bike ride. But that’s not all. The wearable wireless speaker comes with sweat and weather resistant which is IPX4 rating. As a result, it won’t cause static. The four-way stretchable cover will prevent dust to cling into the speaker. Cowin E7 Pro is for anyone who needs to use a quality ANC headphone for an extended period. The earmuffs are plush and thick and fit very comfortably on the ears. The headphone is a looker, but it’s durable as well. Cowin is especially exceptional for its care to the listeners. The E7 Pro comes with professional protein ear pad along with 90 swiveling ear cups. Covered with the protein ear cushions, the Bluetooth headphones are durable and comfortable. 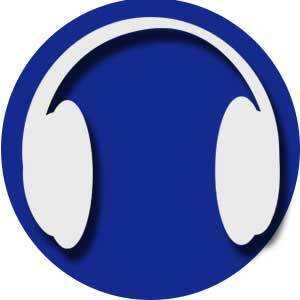 Moreover, the listeners can listen to the music for a long time without feeling pain. Beyond that, the best bass headphones integrate with professional noise canceling technology. The advanced technology helps to reduce outside-sound while you’re on traveling, working or doing anything else. Even added to the list, it can minimize airplane cabin noise, city traffic or busy office noise. The noise canceling feature filters out pretty much all ambient noise allowing you to zone into what you really want to hear. If you’re going to have a conversation, the headphone has a built-in microphone too. Overall, these headphones are quite a wholesome package. Battery life of the headphone on the single charge is 30 hours, and you can keep the noise canceling feature activated the whole time. The noise canceling feature works both with and without wire. With all of that feature, the main deal with headphones, the sound quality, is really where they didn’t compromise. The headphones provide deep bass, and the higher and lower notes can be heard with distinct clarity. With lots of variety in headphones styles, you may be confused to choose the best one to fit you. However, following some necessary things may lead you to get the best wireless headphone, you deserve. Here, consider the following things before finalizing your decision. 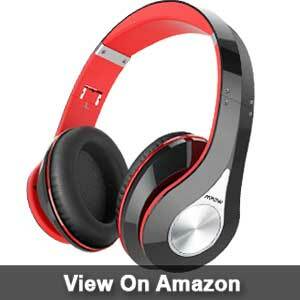 Around-ear is the popular name of circum-aural headphones. It comes with big drivers who lead the headphones to be spacious. As they cover the ears entirely, it prevents noise isolation to enter into the ears. 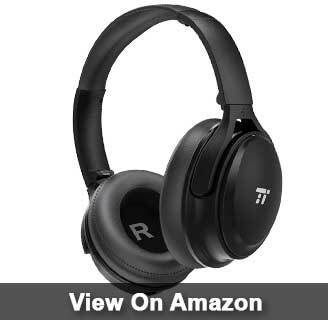 Over-ear headphones are favorite for traveling, home listening or office uses. Similar to the over-ear headphones, the on-ear headphones are also designed and worked on the ear. But the difference between them is the place of cushion. In over-ear, cushions sit on the outer ear instead they are on the enclosing ear on the on-ear headphones. In on-ear headphones, you won’t enjoy noise cancellation rather listen to the sound around you. IEM or in-ear monitor headphones fit each canal inside the ear. It comes with foam or rubber to prevent it from falling from the ear. So, it gets popular among the sportsmen. Moreover, in-ear headphones work more precisely for noise cancellation than over-head headsets. If you want to enjoy undisturbed music at a stretch, noise cancellation technology provides you the great extent. Though you can’t find it in any cheap headphones, a good pair of headphones will meet you peaceful listening. Ear cups help you listening to music smoothly and the silky way for a long time. Usually, wearing headphones for a long time will create problems for your hearing. But using a cushion made ear cups will help you listening safely, at least 3 hours. Sometimes, it is essential for over-ear and on-ear headphones if you want to use them for a long time. Integrated with Bluetooth and noise cancellation in a headphone requires heavy battery life. So, don’t forget to have an in-depth look at the battery life. If you fail to choose the heavy duty battery, you may fail to catch out your connection in the middle of your important conversation or workout in the gym. The built-in microphone is not even a luxury but essential addition to the microphone. You may rarely find a headphone without the microphone. And here I don’t want you to be fooled. So check your headphone if it’s the rare headphone without microphone or not. For the workouts earbuds and athletes. Water resistance or sweat resistance is an excellent feature. Whether you’re a fitness freak or athlete, you must sweat while you’re exercising. The above feature will save your headphone from being wasted by the water. Apple Sir or Google Assistant makes the life more comfortable for advanced people. Even, it’s no wonder that people are interested in using voice assistant in al sphere of life. So, voice integration is a critical component for the headphones. The voice assistant will aid you to access easily over your phone for hands-free calling and many more. You must already be eyeing several of these headphones. I’ve only mentioned 10 headphones, and you can already see they can serve such a different variety of purpose. Are you going to be sitting in a studio or are you going to be cycling wearing those earphones? Don’t just try to get “the good one,” actually asses your needs, and find a headphone that’s right for you. It can really make a difference.